You don’t have to be Scottish to dance Scottish! Anyone interested in dancing, exercise, and fun is invited to join us. Please dress casually, and bring a pair of soft-soled shoes. You can come alone or bring a partner. The basic steps and formations are easy to learn. Here in Connecticut, the New Haven Branch of the Royal Scottish Country Dance Society offers weekly classes in New Haven, Windsor, Middletown, Mystic, and New Canaan. Scottish Country Dancing traces its roots to the 18th century when English country-dance formations were mixed with Highland music and footwork. Unlike traditional solo Highland dancing, Scottish Country Dancing features multi-couple sets working together to complete a sequence of formations. 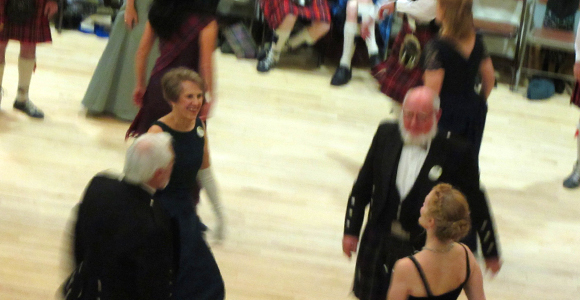 In additional to classes, the New Haven Branch sponsors a yearly Highland Ball in March with a Brunch Dance the following day. Individual classes host dances throughout the year. In the Fall, the Nutmeg Workshop helps everyone improve their technique, followed by a potluck supper and dancing in the evening. Are there health benefits? In 2014, research from the University of Cumbria (UK) suggested participation in Scottish country dancing could reduce the ageing process. It also helps prevent dementia through the complex interplay of cognitive skills needed to memorize steps and formations, interaction with other dancers, and the effect of dance music on the mind. Scottish country dancing also develops a sense of community and enjoyment, which encourages continued participation and long-term involvement, linking it to good health, a positive attitude, and longevity. NOTE: The block directly below, titled “Leave a Reply” is an unused and unwanted feature of the software that powers this site. It remains only because we lack the technical expertise to remove it.